Since 2006, Annette Larkin Fine Art has provided specialist services to collectors of contemporary, indigenous and modern art. With unsurpassed expertise in dealing in secondary market contemporary Australian art, Annette Larkin Fine Art provides tailored advice and services in all aspects of purchasing, valuing and collection management. 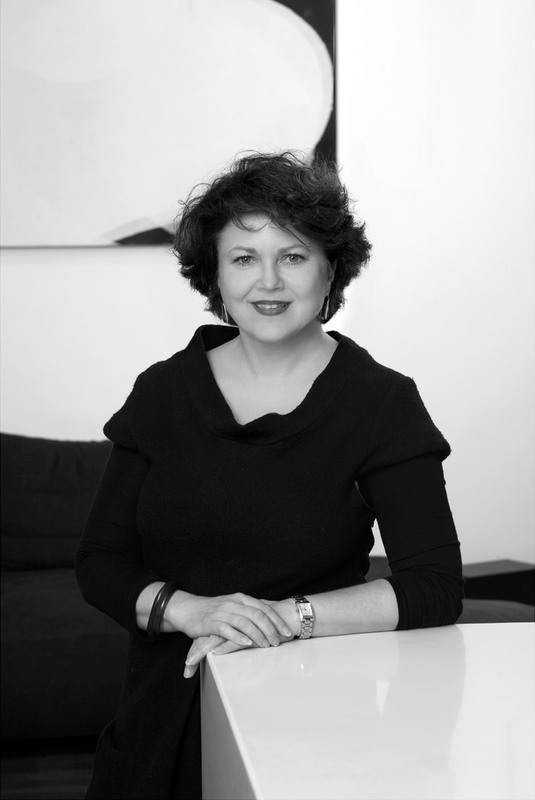 Director, Annette Larkin, brings over three decades of specialist experience in the Australian and international art markets. Currently Larkin manages major corporate collections, works closely with private collectors of significant Australian and International art and is highly respected as a valuer of many areas of collecting. In her 11 years at Christie's Australia, many as Associate Director and Head of Contemporary Art, she established stand-alone sales of contemporary art, liasing and travelling to Asia, United States and Europe for the auctions of contemporary and modern, international and asian art. Prior to this, Larkin worked at the major Sydney commercial gallery, Macquarie Galleries; with the Art Gallery of New South Wales and Newcastle Region Art Gallery. In 1994 she was selected by the Australian Government as the Australian Curator and Commissioner for the VIII Indian Triennale, New Delhi. At a national level Annette Larkin is a respected art valuer and was a committee member for the Australian Government Cultural Gift Scheme (2007-2010). In addition, she is a member of the Australian Valuers and Auctioneers Association; a Foundation member of the Art Gallery of New South Wales and a Museum of Contemporary Art Ambassador. 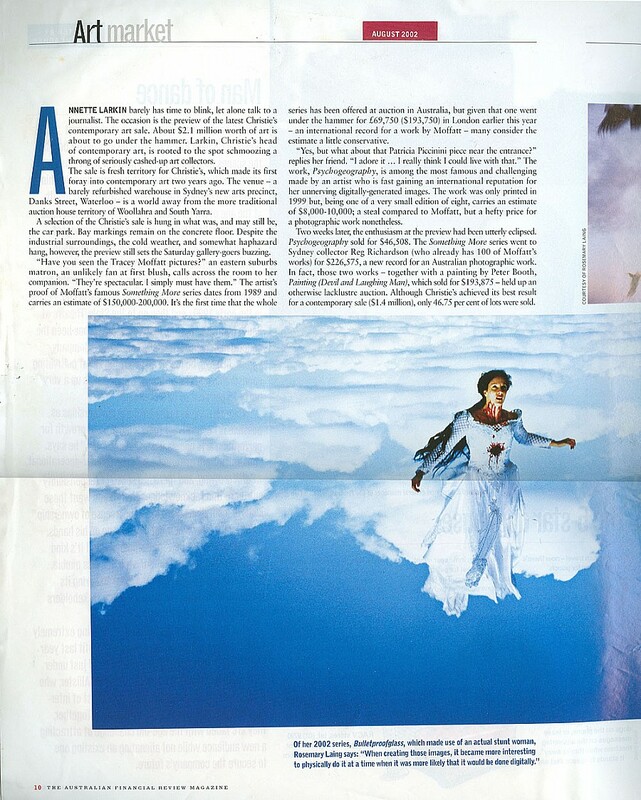 In 1993 she was a founding member, and Chairperson (1996-1998) of the very successful Contemporary Collection Benefactor Program at the Art Gallery of New South Wales, Sydney. Approved to value for the Australian Government’s Cultural Gifts Program - Australian painting, works on paper, prints and sculpture after 1788; Australian photography after 1940; Australian video, new media, digital art, conceptual, installation and performance art after 1970; Australian studio ceramics after 1950; Australian Indigenous painting on canvas and paper, and limited edition prints after 1980; Australian Indigenous new media, digital art, conceptual, installation and performance art after 1980; American, European and British painting, works on paper, video & photography after 1950; South East Asian paintings and works on paper after 1920; Indian paintings and works on paper after 1920; Asian and Indian painting, works on paper, sculpture, new media and photography after 1970; New Zealand paintings, works on paper, prints, photography, sculpture after 1900 (except traditional Maori Art); New Zealand video, new media, digital art, conceptual, installation and performance art after 1970. ANNETTE Larkin has a lot to thank rats for. It was her inability to dissect them and her loathing at having to tie their aortas with string that persuaded the Christie's art specialist of 10 years to drop biology and take up fine arts. While those early days in the lab at the University of NSW may have been tough, Larkin's career since changing direction has blossomed. 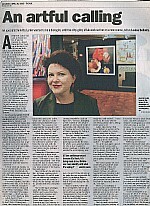 Her curriculum vitae is a straight line heading due north: eight years at Sydney's Macquarie Galleries; a year as curator at Newcastle Regional Gallery, then Christie's where, for the past five years, she has been an associate director and headed the only art department in the art auction arena that holds exclusive yearly sales of contemporary art. ANNETTE LARKIN barely has time to blink, let alone talk to a journalist. The occasion is the preview of the latest Christie's contemporary art sale. About $2.1 million worth of art is about to go under the hammer. Larkin, Christie's head of contemporary art, is rooted to the spot schmoozing a throng of seriously cashed-up art collectors. The sale is fresh territory for Christie's, which made its first foray into contemporary art two years ago. The venue - a barely refurbished warehouse in Sydney's new arts precinct, Danks Street, Waterloo - is a world away from the more traditional auction house territory of Woollahra and South Yarra. A selection of the Christie's sale is hung in what was, and may still be, the car park. Bay markings remain on the concrete floor. Despite the industrial surroundings, the cold weather, and somewhat haphazard hang, however, the preview still sets the Saturday gallery-goers buzzing. ON A SUNDAY AFTERNOON in August this year, a group of around 200 people gathered on the fourth floor of Sydney's Museum of Contemporary Art. The group was made up of art collectors, journalists and curious onlookers. For the first time an auction devoted entirely to contemporary Australian art was about to take place. Two hours later, the international auction house Christie's had sold more than three-quarters of its 127 lots, bringing in nearly $1.2 million. Some of Australia's leading artists' work had gone under the hammer and included such well-known names as Rosalie Gascoigne, Howard Arkley, Tim Johnson and Susan Norrie. Not only did Christie's inaugural contemporary sale do incredibly well; the auction was effortlessly cutting edge. The sale's bright orange poster and its catalogue were in themselves bold design statements - a far cry from the solid and worthwhile images that the company uses for their other painting sales. Something had definitely changed. Annette Larkin, Christie's head of contemporary art and its recently appointed associate director, had pulled off a coup. A month later when we meet, Larkin considers the success of the sale as a significant step forward for the Australian art market. It's also a significant moment for Larkin's career. She's a woman who has built a solid reputation in the arts and is someone who has done it in a low key, self-effacing way. 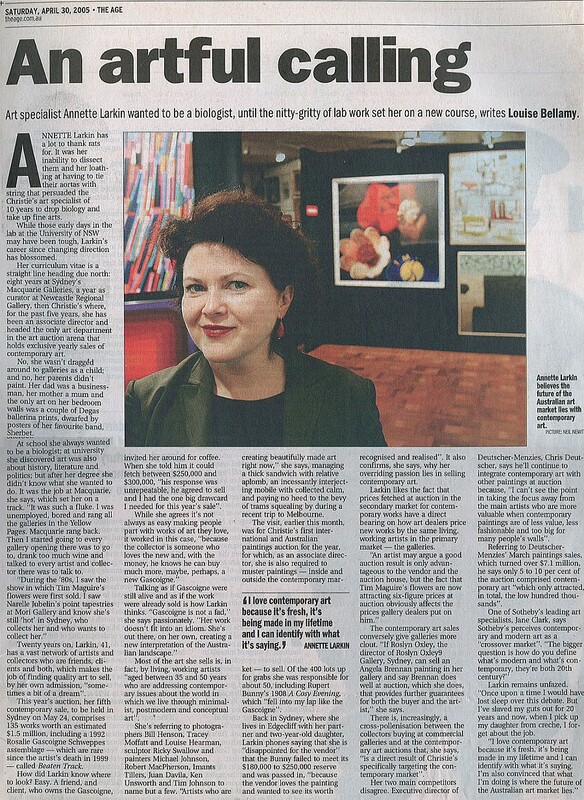 From her days with the now defunct Macquarie Galleries, one of the country's longest-running and most respected commercial exhibitors, to curating the Australian component for the Indian Triennale in 1993, Larkin has made considered and intelligent choices. Spotting an emerging talent, Christie's offered Larkin a position with the company in 1996 with the express brief to introduce the auction scene to contemporary Australian art. "From the moment I joined the company, Christie's wanted me to develop the contemporary art market," recalls Larkin. "Contemporary art at auction has always been seen as a little scary because sometimes the work of contemporary artists at auction doesn't match their gallery prices. I wanted to do it properly and I wanted to look after everyone from the artist to the buyer."